There are currently 152 people online. Cougar introduced the GX V2, a new line of 80Plus Gold power supplies. These modular units are available in 600W, 700W, 800W, 900W, and 1050W editions, and feature Cougar's VORTEX fan. 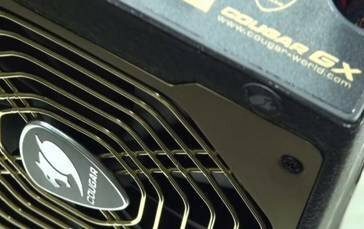 COUGAR, leading German brand of power supplies and PC accessories, have launched their new high-end series of power supplies specifically targeting demanding gamers, the COUGAR GX V2 series. The 80Plus Gold certified GX V2 series comes as 600W/700W/800W/900W/1050W versions and provides up to 93% peak efficiency. This is the highest efficiency standard possible in the industry at the moment. One major upgrade in this revision is COUGAR’s patented VORTEX fan, which in the GX PSUs series comes in a 140mm series hydro-dynamic bearing, which not only dramatically improves lifetime but also reduces potential noise to a minimum. Also internal electric filtering has been further improved to lower ripple and increase efficiency. The advanced modular cable management is further improved by utilizing new flat cables that simplify installation as well as reducing air friction in order to maximize airflow. This gives gamers the power they need, and flexibility of easy upgrades they demand. Automatic dynamic load distribution multi-12V rails provide power separately to the GPU and CPU. Particularly in multi-graphics setups this improves the performance and safety of the 12V rails considerably for systems with high-end graphics cards in SLI® or CrossFire® mode by warranting high voltage stability to keep components safe.